Although the Caesar (the cocktail, not the salad) is a drink reminiscent of my wayward twenties and several queasy morning-afters, I still have a very soft spot for this tomato-based cocktail. Okay, I wasn’t actually that wayward, though perhaps my story about the Kamikaze shots had you thinking otherwise. At the end of a long dinner shift at the restaurant where I worked during some of my university years, the staff would line up at the bar with the vodka, Clamato juice, Worcestershire sauce and Tabasco sauce to make some stiff cocktails. Who said these babies need to be relegated to brunch on Sundays? If you’ve never heard of a Caesar that doesn’t involve romaine lettuce and creamy dressing, you’re not alone. It likely means that you are neither a Canadian nor a regular visitor to my maple-leafed homeland. In fact, you are probably thinking that the drink in the picture looks suspiciously like a Bloody Mary. However, there are several distinct differences, starting with the Clamato juice. This juice, as the name suggests, is a mixture of tomato juice and clam broth and is found on the shelves of most supermarkets in the United States. I know the flavor combination sounds questionable, but you really can’t taste the clams. At least I can’t. In fact, I prefer it over tomato juice because it is not as thick and makes the cocktail go down more smoothly than a Bloody Mary. The Clamato juice is mixed with vodka, kicked up with Worcestershire and Tabasco sauce (I like mine spicy) and served in a glass rimmed with celery salt. Traditionally, it is served with a rib of celery, but I also toss in a couple of pimento-stuffed olives. The big ones. I always save them to the end because, after marinating in the cocktail, they become little drunken orbs of joy. So, who the heck thought of this crazy drink combination? As the story goes, the Caesar was invented in 1969 by Walter Chell, who was given the task of coming up with a signature drink for a new Italian restaurant opening in Calgary. Chell found inspiration in the classic Italian dish, Spaghetti alle Vongole (Spaghetti with Clams). 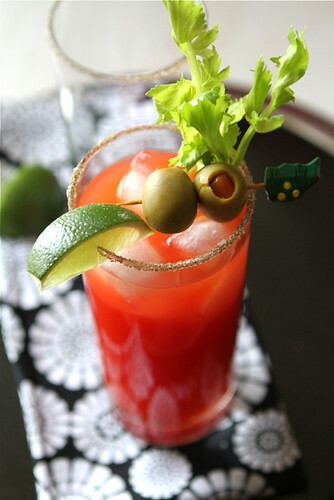 The Caesar became an instant sensation and continues to be so popular that, in 2009, a petition was started to make the Caesar into Canada’s national drink. Move over Molson…here comes the Clamato. If a petition isn’t enough to convince you, then perhaps this purported statistic will: Over 350 million Caesars are consumed each year in Canada. There are only 34 million people living in Canada. So, either we’re filling up the mountain water holes with Caesars (which might explain some of those drunken moose stories) or we think these cocktails are pretty darn tasty. So, get out there and pick up some Clamato juice and I’ll raise my Caesar-filled glass to you. Eh? Spread the celery salt onto a small plate. 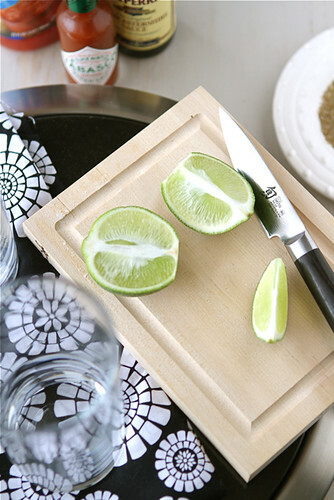 Rub the rim of one 12-ounce glass with a lime wedge. Turn the glass upside down and dip the rim of the glass into the celery salt. Repeat with remaining 3 glasses. Fill each glass with ice cubes. Divide the vodka equally between the 4 glasses. Pour Clamato juice into each glass. Season each Caesar with several dashes of Worcestershire and Tabasco sauces, to desired spiciness. Stir each cocktail with a stir stick. Garnish with celery sticks, olives and remaining lime wedges. Serve. 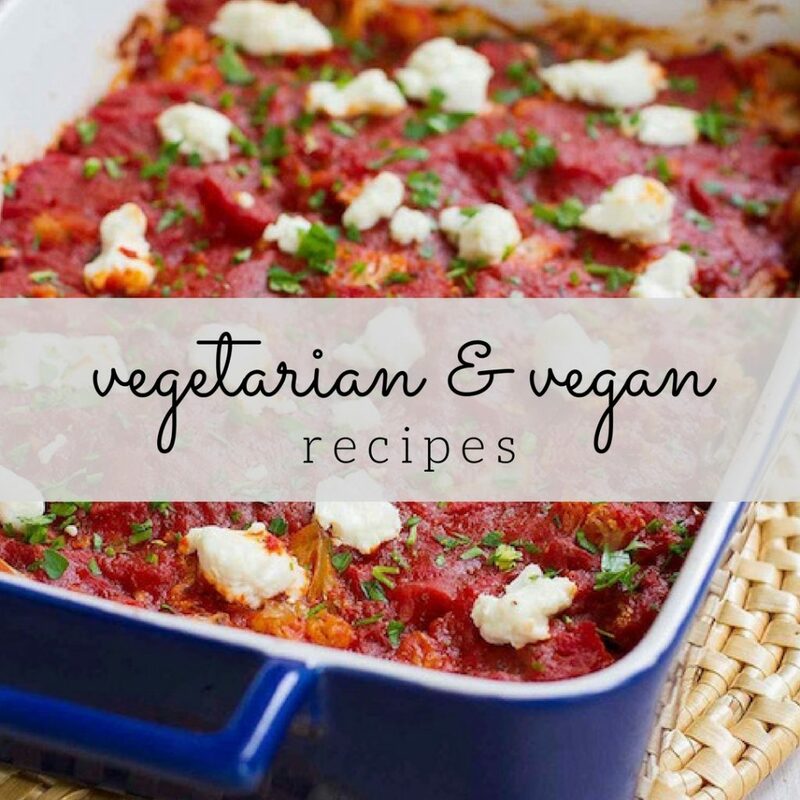 If you make this recipe, I’d love to see it on Instagram! Just use the hashtag #COOKINCANUCK and tag @cookincanuck, and I’ll be sure to find it. Season each Caesar with several dashes of Worcestershire and Tabasco sauces, to desired spiciness. Stir each cocktail with a stir stick. Garnish with celery sticks, olives and remaining lime wedges. Serve. *Not included in nutritional information. Great photo Dara, candadian bloody cocktail could be on my table right now at 7am looks and sounds delicious! 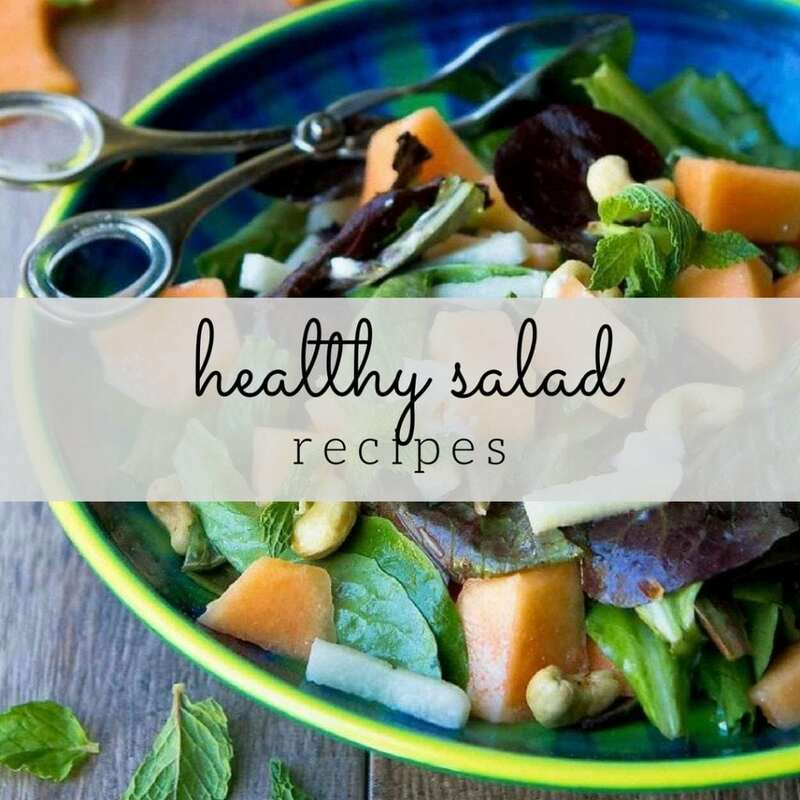 Its healthy too with the vegetables (smile) I want one! This is a staple at my house whenever I venture home! Oh how I love a good caesar! We’re not Canadian, but my family loves these cocktails. So much better than using tomato juice! This morning anything bigger than an olive would be brunch and besides it matches up with the pizza I have,well I hope its a pizza, HO,Ho,!! I make mine with a generous splash of dill pickle juice and decorate with a partially sliced pickle on the edge of the glass! I still have a caesar once in a while. Is Clamato juice available in the States? Of course it is available! Right beside all the other tomato juice products. I love the stuff. What a great drink. I love the celery salt on the rim and the spiciness of it. It’s pretty to look at too. My husband claims that making the perfect Caesar is difficult to achieve. I may have to use this recipe to prove him wrong! I see I’m not the only one with booze on the brain! This looks fabulous! I love bloody mary’s so I’m certain I’ll love this, too. I’m IN. I’m SOOO in. Bloody Mary’s are my all time favorite drink (when done well). I’d be ALL over this drink. Clam juice and all! We have a special twist on ours – a tablespoon or so of pickle juice! (We’re partial to Claussen pickle juice, maybe even pickle juice snobs). And of course we garnish with a pickle spear! Having never had the Canadian Clamato, is there that big of a difference? I know the American style works quite well with most of my Canadian friends, I’ve never had one turned down! These look really good, Dara, and that comes from a girl who has never liked Bloody Marys. Hmmm. 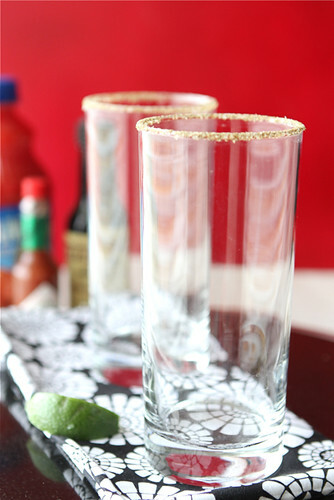 Love the celery salt on the rim, too! Oh my I could use this about now. Pinning now! I like a little horseradish in mine! Great post Dara. Funny I didn’t know that Caesar was a Canadian drink. Growing up in Ontario, I just always knew of this drink and assumed those south of the border drank them as well. They are far better than bloody mary’s (in my humble opinion). Have a great weekend and enjoy the football! Go Giants! Go Eli! This will forever be immortalized as the drink that my sis-in-law made for me every Christmas when our family arrived to visit the in-laws after a long ferry/driving journey. She, and we, add almost anything pickled instead of the celery; green bean, asparagus spear, they all come pickled and ready to spark up this fabulous drink. For those who think it might be weird…just TRY IT ! Remember, at one time in history, pizza was weird too. No way can anyone resist a Caesar! One suggestion, pour Worcestershire & Tabasco on the ice, then add the vodka, then stir, then add the clamato and stir again. I also add a dash of salt and pepper on top. Gorgeous photographs! 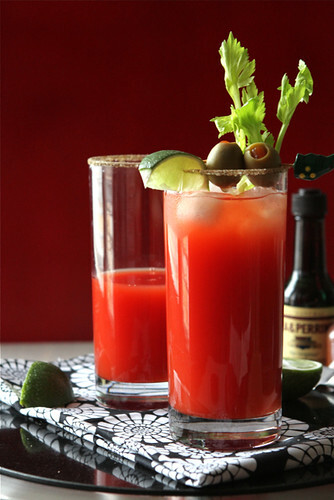 I love Bloody Caesars even though I tend to prefer my Marys on the thick side. Some of those million servings were probably me. Even if I’m not much for drinks, I can appreciate this drink and especially these gorgeous photos. You’re right, I’ve never heard of the drink, but have certainly heard of the Bloody Mary. You definitely need the salt and pepper on top and a splash of lime juice too. At least according to my husband who makes the best Caesars ever! My hubby would give you big hugs for this! Hands down my all-time favourite cocktail. And in my days working in bars I probably made thousands of them. Literally. Love the pics, Dara! Really great stuff. I love this version of a Bloody Mary! It was already one of my favorite cocktails and I think yours with the Clamato juice might be even more delicious. just calling this the Caesar cocktail makes me want it! 🙂 this sounds delicious and the photos are stunning! cheers! 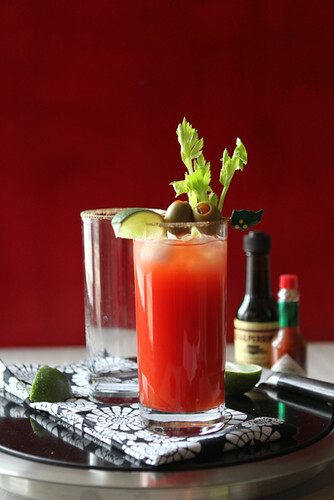 We love your version of Bloody Mary, and the use of cellery salt is just perfect! What a gorgeous picture! I feel a little left out of all the fun… I wonder how it would taste as a “mocktail?” I think I’ll try turning it into one and let you know how it goes. Bloody Marys are my FAVORITE!!! I am drooling and sad because I have to wait 5 more months til baby is here to enjoy one!! Love the celery salt edging on the glass. Tomatoes makes this entirely healthy, right? These look absolutely stunning! I’m not usually a fan of Bloody Marys but after seeing that photo, I might need to double check! Motts clamato makes it truly Canadian, and delicious, no other clamato juice I’ve tried comes close! Yum. One of my favourites. Better than celery? Pickled spicy green beans, or pickled asparagus. Also, some people make them with horseradish in them. Also tasty. 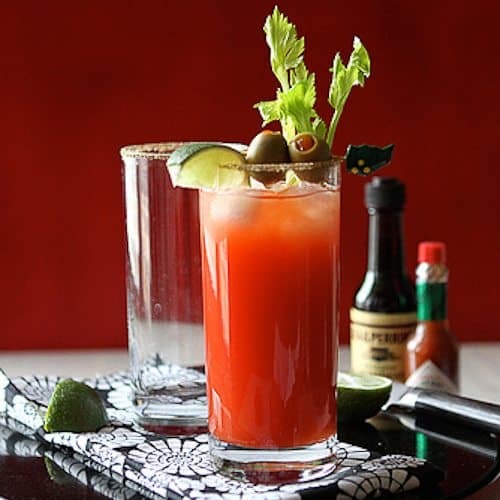 Save-on-Meats, a local diner in Vancouver, makes peperoni infused vodka to use in their caesars. Oh man are they good. I hate vodka, so I make my version of the Bloody Mary with light rum. For the tomato, I use the zippy version of V-8 (how healthy am I? ), throw in some Worcestershire and nirvana! I like the idea of the olives, though, maybe some pickled garlic, too. Mmmm, good thinking. If I hadn’t already had dinner, I’d be making a cocktail now! 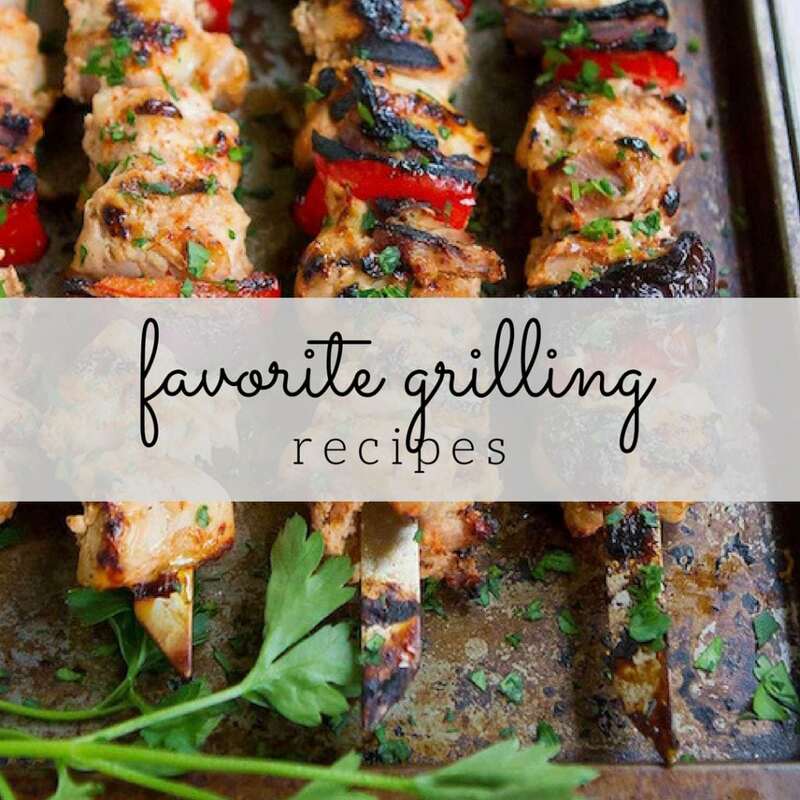 What a delicious collection of recipes. Every single one looks bette than the last. One of my favourite drinks and a Canadian classic. For garnish though you can’t beat spicy, pickled green beans or asparagus vs. celery. A Bloody Mary is the drink of choice at the Hamlin House on every holiday. I’ll have to try it Canadian Style – another AWESOME for them is Zing Zang, and a spear of pickled okra. 2/3 of the Lafayette Trails Runners went this morning, it has finally cooled down in St. Louis and was in the 70s at 7 when we hit the trail. Yay! American clamato is very different than what can be found in Canada. Here’s a great compromise when in the US – use a spicy tomato juice and mix with about 50% American clamato. Spice and garnish as per your normal recipe! We are from the US and have been fishing in Canada for over 20 years. Year before last it was very hot, so instead of cooking we went to a local bar to eat..only 2 places to eat where we fish and one is a bar. So we went eat and saw these people drinking the most wonderful looking drinks WITH DILL PICKLES which I happen to love. We asked what they were at they said they were Caeser’s Canadian Style. The recipe is all the same except…..they used season salt around with rim with lime juice, and instead of celery they put a dill pickle spear down the middle. IT IS WONDERFUL!!! So that is the only way we ever have had them. As a matter of fact, just had one!!! lol Was great!!!! Molson Canadian beer is brewed in Belgium. So there’s plenty of room for the caesar to be our drink! I love the recipe but use Tequila instead of Vodka. I suppose it becomes a Caesaro, a Caesarian? I need help getting the right name for it. LOL. I think you’re on the right track, Tony! I’ll have to try it with tequila sometime. Actually in Mexico its quite popular and its called Vampiro. I made it at home, a perfect beverage! I’ve made several variations on the venerable Caesar and they’re all good. One ingredient that puts them over the top is an oz or so of kimchi juice.